Refer to the OSG 'OZONE' for an additional 30% off the products found on the pages below. Click the Link below for the current list of items! OSG Tap & Die, Inc. (OSG) has released an update to its calculator app for iOS devices. The new update includes full metric calculation capability and improved compatibility for iOS7. Is there a gap in your performance? If you're not using BIG-PLUS tooling, you are missing dramatic performance benefits available to you now. 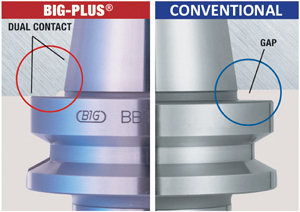 When BIG-PLUS® fits the application, we guarantee higher performance. With just a little information about your equipment and application we can tell you if BIG-PLUS® will improve your performance - If you test it and it doesn't perform, we'll take it back - No Charge.